Following the Imperial Bank Limited In Receivership(IBLIR) payment disbursement ban lifting by a the High Court on 15th July ,Kenya Depositors Insurance Corporation (KDIC) and NIC bank in a joint agreement will give the collapsed Imperial Bank's depositors a maximum of kes2.5 million each as deposit claims starting on 26th July 2016. 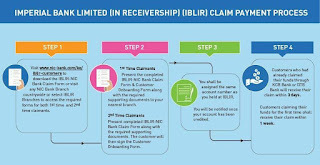 Tuesday 26th July,will be the first day when the NIC Bank will start receiving and processing claim forms from IBLIR depositors.Customers who already claimed their deposits through KCB or DTB will have up to a maximum of kes1.5 million.First time claim lodgers will get up to a maximum kes2.5 million as deposit claim disbursement from NIC bank. Claiments will get the services from all over thirty NIC Bank branches and five selected Imperial Bank branches namely ;Diani,Kilifi,Malindi,Watamu and Parklands branches. The clients who will open personal or business accounts with the lender will enjoy zero rated services including; zero ledger fees,zero transaction fees,free ATM withdrawals,free Mpesa transactions,free online banking and free mobile banking services. Download the claim forms or visit any NIC Bank branch or selected Imperial Bank branches for 1st time or 2nd time claiments. Fill in all the require details. 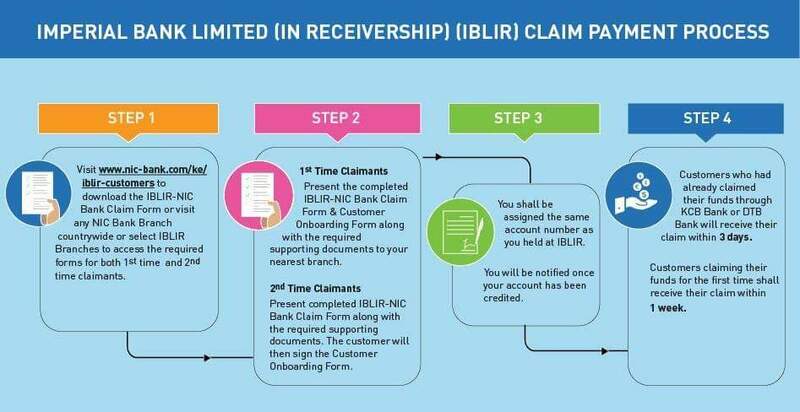 Present the filled in forms at any NIC Bank branch or the selected Imperial Bank branches for claim processing and disbursement.